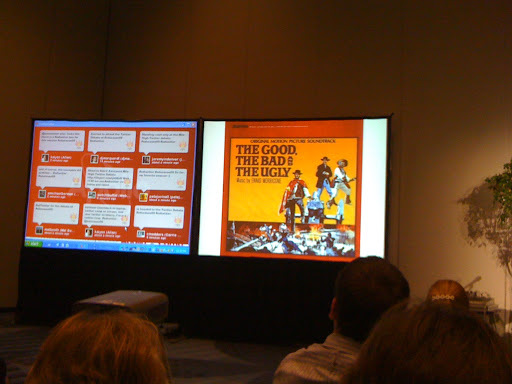 This post is “loosely based” (as they say in films) on a series of my tweets (@malbooth) from the Twitter Debate session at Educause09. I’ve cleaned up and explained a few tweets in the interests of your sanity. Mostly academic theatre so far. Noise, safety, security, content, distractions, spam, reality? Or passion, diversity, helpful, connections, real time? CIOs as orange cones over potholes? Is it about experimentation, innovation, making mistakes, exploring? Do ground rules inhibit exploration & experimentation? Google on innovation. Comes when reflecting, not on schedule in a divisional structure. Self-organise in shared-value culture. Who cares what a CIO thinks about Twitter anyway? Twitter offers transparency, but [there are] some costs – uni reputation needs to be considered. Voices or consistency? Dialogue is important. can practices be integrated? Is it a distraction? Someone raised the importance of the back-channel as a toll for LISTENING! Can lead to moments of authentic connection! Important to be able to use all forms of media for communications! This was a very lively, active and well-presented session. My thanks to the two presenters: W. Gardner Campbell, Director of the Academy of Teaching and Learning and an Associate Professor of Literature and Media from Baylor University (who played the radical academic) & Bruce Maas who played (and is) the CIO of the University of Wisconsin-Milwaukee (all universities should be so lucky). I think you did a great job of capturing the spirit of our "debate". The goal was to engage the audience and get some dialogue going about a pretty important topic; social networking and teaching and learning. Thanks for making some serious time to post this. Regards, Bruce maas uwm_cio. This was a really helpful and valuable post of our twitter "debate". Our goal was to engage our audience in person, and remotely, into dialogue about the use of twitter and other social media for teaching and learning. Your post was a real service to the community that is interested in this dialogue. Thanks so much. Bruce, uwm_cio.